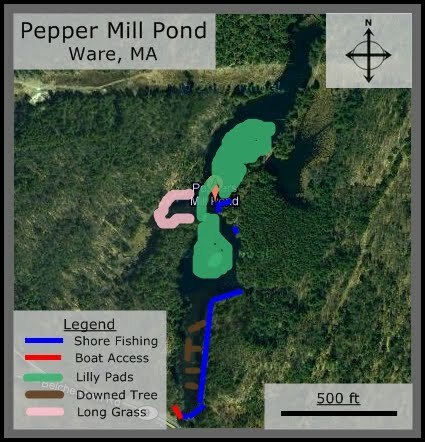 Pepper Mill Pond is a very isolated pond in Ware, MA located right off of Route 9. It is an interesting body of water though. It's almost like a slow moving river with a pond stuck to the side of it. If I plan on going fishing from the shore in the Amherst area this is my go to spot. When you first get to Pepper Mill, you will see a long skinny section of the pond with a lot of downed trees in it. This spot is loaded with trout and you'll see a few people sitting there with their rods set up. If you're here for bass, don't both stopping anywhere on this part of the pond. I've tried it about 6 times and haven't gotten a single hit. Instead, you want to follow a long path, about 3 minute walk all the way around the pond where you will see a peninsula sticking out into the pond, which divides it into two halves. The only problem with this pond is there is very limited access to the water from the shore. Thinking back on it, there are about 8 spots that you can fish at from the shore, the rest is covered in thick forage. I've fished there about 7 or 8 times and only once have I gone without catching a fish which was early this June. Last fall when I fished it, I caught at least 2 or 3 bass every time. I've caught almost all of my fishing on the eastern shore of the pond, both on the southern and northern half. The weeds on both sides are very thick so I've only been able to use Texas rigged worms here but they've been successful for me. If you can, I would suggest getting a canoe or kayak in. There are so many great spots, especially in the northern half that are impossible to fish from the shore. Also, there are always fishing breaking in the middle of southern half, but you just can't cast far enough to reach them. It is one of the most tempting ponds I've ever fished but it's just so hard to actually get your pole in the water. Successful Baits: Worms- Pumpkin seed green, Black & Orange, Red, Yellow, & Black. Boat Access? Yes but there is a steep hill to climb down to reach the water. Canoes and Kayaks best options. I tried Peppermill last week. Fished first half of the day in the recommended areas. I got a couple of 'taps' on the worm and lost 2 to pickerel that bit right off! I went back after a late lunchj, still nothing. On my way out at dusk, I stopped at that front basin. First cast on a jerk bait got me a 2+ !! Second cast was a chunky one pounder. The bugs and poor night vision sent me home, but, I will go back,,,soon! Does anyone know if Beaver Lake has any public access,,,would love to try that. Beaver Lake has no public access, unfortunately. You need to live on the lake or know someone who does that's willing to give up a paper pass.